Download the new STUI through Steam Workshop. As part of this new release, we’ve moved our documentation to our public ShackTac wiki. You can report issues in our tracker. I don’t post to my site as much as I probably should, so in order to help correct that, let’s go through a few things that have happened over the last few months! For starters, I updated my ‘Dslyecxi on Youtube‘ page to include all current playlists, revising the info in it slightly in the process. Whee! You can also check out an alternate view of my channel as seen on Youtube Gaming. It doesn’t look half bad, really. In closely related news, my Patreon campaign continues to provide time to work on projects like those you see above, which is a happy thing to see! Many thanks to everyone who’s contributed, and I hope you’ve enjoyed the results! As always, if you like what I’m doing and have the means to support it, it’s always greatly appreciated. I have a mountain of ideas I’m working my way through video by video, and it wouldn’t be possible without this support. Thanks! 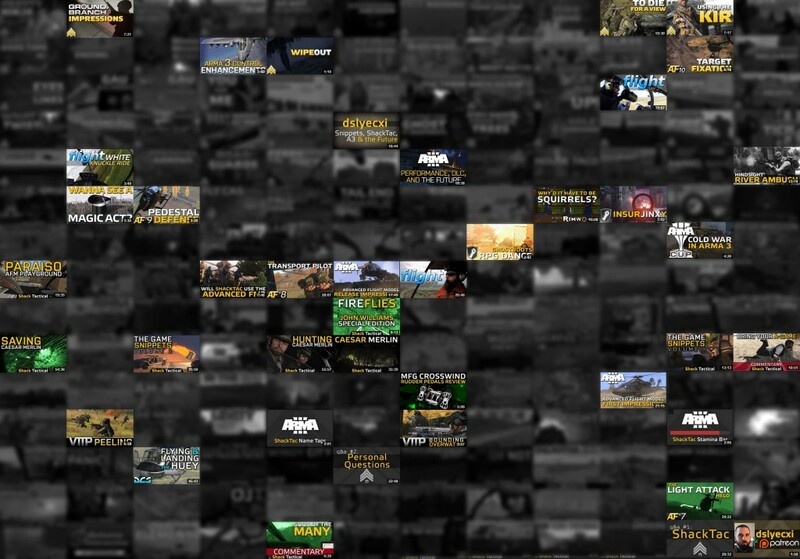 The ShackTac User Interface compilation is now available on the Steam Workshop. I’ve released the ShackTac Map Gestures mod, which you can read more about and download here. A year ago I found myself in the position of needing to decide what the future held for me, of choosing between wants and needs and reevaluating priorities. As a result of this, I turned to ShackTac and explained what I’d decided on – that instead of chasing the fickle nature of Youtube as some means of support (which is, at best, a difficult prospect – made more difficult if you happen to be in a non-mainstream niche), I’d float Patreon as an option and see what might come of it. The hope was to be able to more directly find the support needed to justify investing time into my video work, to not only sustain what I was already doing but also reintroduce the heavier projects that required so much time to produce. To say that that’s an intimidating step to take doesn’t quite convey the significance of it. On May 9th I posted my plans to ShackTac, finding a reassuring amount of support in the process. The next week I went live with the project, posting a video about it to my channel and watching to see what the broader reaction would be. It was humbling and motivating to see the response. Patreon validated itself as a means to fuel my work, and in short order I was able to devote roughly two weeks each month to pursuing projects for it – be they original creations, extra session videos, scripting work, or one of the other facets that fed into my productions. Since then, I’ve done 180 videos for my channel. Here’s a look at all of them from the Patreon announce to May 5th, 2015. Out of those, I can look at roughly 40 of them and say that without Patreon, they almost certainly would never have been made. I’ve highlighted them here – that’s about one in five videos that very directly can be linked to Patreon, excluding any bonus session videos I otherwise might not have done. There are common themes to these – training videos, Q&As, opinion pieces, commentaries, compilations, videos based on scripting or design that I could only justify as a result of Patreon, or the STNT/Stamina mod releases. While the average session video might take a few hours to create, these highlighted ones generally took significantly more to produce – many of them being the result of weeks of effort, such as the VTTPs, Art of Flight, the real-world Flight series, Hindsight, the DCS flight video, etc. 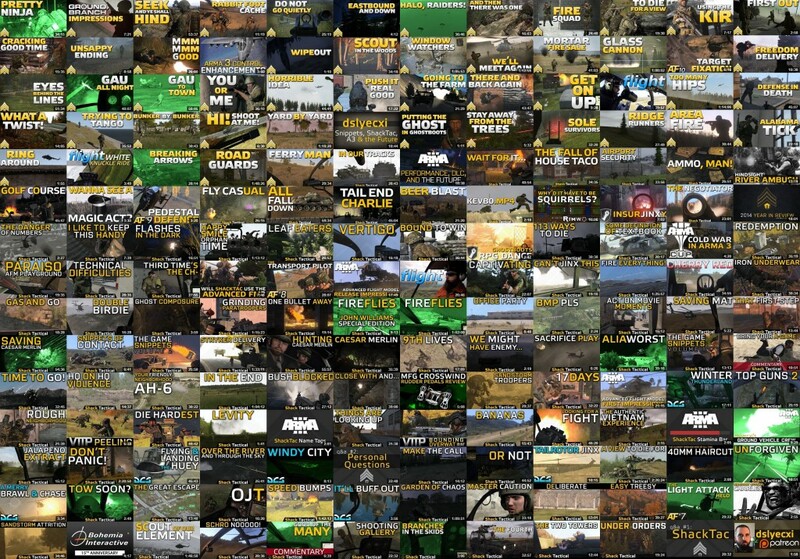 Anything Arma-related often requires an extensive period of preproduction, during which both in-game and voiceover scripts are developed to help visualize the topic at hand, all before ever filming anything. Mission creation took that in a different but similar direction, with iteration after iteration followed by careful testing, all in order to ensure smooth running when actually played. Looking back on these videos, the behind-the-scenes work that led up to them, as well as the day-to-day work that feeds into every creation, it all adds up to something significantly taxing. Add ShackTac itself on top of that, plus my other non-Patreon/Youtube contract work, topped with a personal life, and my time is well and thoroughly accounted for. In the end, I love what I do, that I’m able to do it, and that so many are willing to support it. I don’t always take the time I probably should to say that, but I hope if nothing else it comes across in the content I put out. Not a day goes by without me either directly working on or thinking about what I’ll be doing next to make good on the support so generously offered me, and I’d be hard-pressed to find someone who’d hold me more accountable for all of this than myself. As to the future – there’s much to be done. I’ve worked up a personal list of sustains & improves relating to Patreon, and I look forward to working to make this coming year be as or perhaps even more productive than the last. To those of you who have offered your support over this past year: Thank you very much! I hope what I’ve done as a result of that has entertained.